A black family, the Cumberbatches, moves into the former Queens home of Archie Bunker years after Bunker had sold the house located at 704 Hauser Street. Ernie and Goodie have another racial debate in a clothing store when a security guard watches them. Ernie attempts to fix Goodie up with a black, conservative woman. Goodie Cumberbatch goes on "Face the Nation" as the family adjusts to living at the old home of Archie Bunker. This spin-off of "All in the Family" features the further adventures of Gloria Stivic and her son Joey. She and Mike are separated and she's gotten a job in a veterinarian's office. The 1968 unaired pilot for what would eventually become the iconic TV series All In The Family. The misadventures of Florence Johnson, a hotel maid who was previously seen serving the Jeffersons. 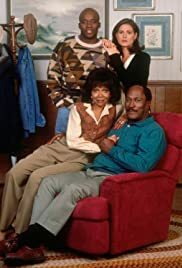 The ridiculous thing about this show was that John Amos, newly popularized by his daddy role in Coming to America, played the father - the show was based on the sketchy premise that a black, politically conscious family moves into the Bunker's old house. That's quite believable - but then what are the odds that a man who looks and acts EXACTLY like James Evans from Good Times, a spin-off of Maude, which was a spin-off of All In The Family, itself would exist in that very same world that we were supposed to believe to be the same one from the 70s? I think the producers of this one thought we were dumb - like we wouldn't expect J.J. to come walking in that front door any moment.